Recently updated soft and hard furnishings throughout, Gorgeous 2200 sq. ft. two bedroom three bath Villa in 5 star Villa La Estancia Resort complex, the only privately owned resort villas on popular Medano Beach. Our Villa is on the 5th floor and has recently received an update of all hard and soft furnishings and décor. It has a second Master lock off feature for versatility and convenience, travertine marble flooring throughout, a well equipped kitchen, stainless steel appliances, side-by-side fridge with filtered water/ice maker, breakfast bar, laundry with washer and dryer and sink. It offers ocean and pool views from the huge marble tiled terrace featuring a propane barbecue grill and overlooking the Sea of Cortez . It's just a short relaxing stroll from the Resort into downtown along the only swimming beach in Cabo. While staying at our Villa you may use all of the luxurious owner facilities and privileges of the Resort. You may also have access to the adjoining sister properties Villa Del Palmar and Villa Del Arco and their pools (complete with Whale slide and Pirate ship!) 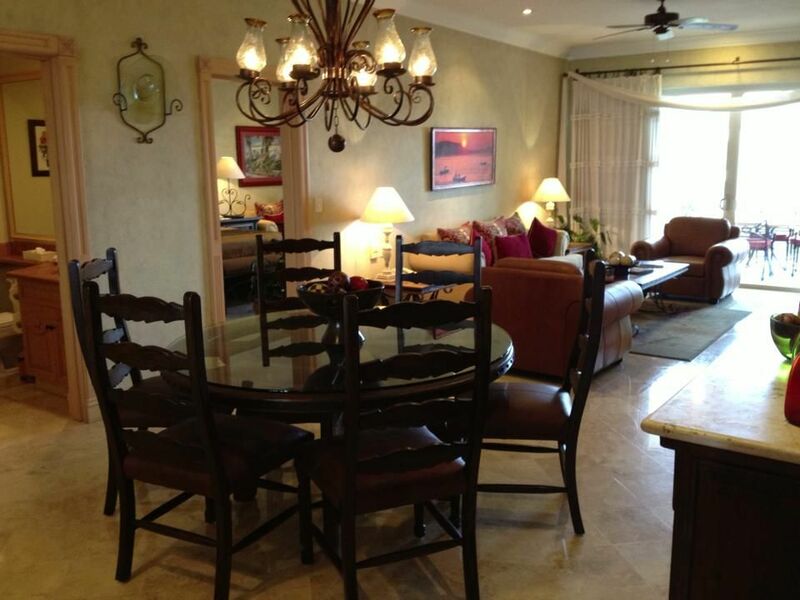 and restaurants, including convenient restaurant charge transfers to your Villa La Estancia account. The Villa's main Master Bedroom has a King bed, terrace access, TV and full bathroom with spacious closets, double sink/vanity and jetted tub. The second Master may be locked off if desired. It has two Queen beds, spacious closets, a sitting area,TV, microwave and coffee maker, a full bath and terrace access. The Mediterranian style living and dining area is beautifully and comfortably appointed with a large dining table, buffet, armoir,coffee table, sofas, chairs, including a full size hide-a-bed and a full bath. For your entertainment/media needs the villa has three large flat screen TV's with cable, a blueray player, stereo CD player, and Wi-Fi broadband internet connection. Villa La Estancia has it's own desalination plant and as such, the water at the resort is purified. * CONCIERGE SERVICES - Can assist you in everything from deep sea charters to restaurant reservations or nightly turn down services. Our concierge and maids are here to make your vacation as relaxing as possible. * ROOM SERVICE - With the ocean view and refreshing sea breeze gracing your terrace, you may never want to leave your room. You won't have to. Simply call room service for a delicious gourmet dinner. * GOURMET STEAK AND LOBSTER RESTAURANT AND PIANO BAR - La Casona, the best Kobe beef steakhouse in Cabo, on site. * POOL BAR RESTAURANT - La Parilla, from a light menu to tropical drinks, make everyday a holiday. Enjoy the incredible view of Land's End while sipping a beverage with your friends. * SWIMMING POOLS AND HOT TUBS- The pools at VLE are beautiful and are chlorine-free! They were designed and built by Sandpiper Pools, an award winning gold-medal international company. They are treated with a pH based cleaning system, feature Pebble-Tec surfaces, a grotto, waterfall, dolphin fountains, gradual entry and a swim-up bar. There are 5 large hot tubs at Villa La Estancia. * TENNIS - Villa La Estancia offers two private lighted championship courts. * EXECUTIVE EXERCISE GYM AND SPA- Including state-of-the-art exercise equipment, TV's, his and hers hot tubs/saunas/steam rooms and showers. * KID'S CLUB - A fully supervised Kids Club on site to ensure that the little ones have fun and you are able to enjoy your holiday with confidence. The highly trained, kid-certified staff provide age specific activities Sunday through Friday from 9am to 4 pm for children ages 4 – 12, with “Kid Nights”, including dinner, arcade, disco and great fun on Tuesday and Thursday from 6:30pm to 9:30 pm. * BUSINESS CENTER HOSPITALITY ROOM. * MEDICAL SERVICES - a Medical Clinic onsite and a private physician on call. * HOUSEKEEPING SERVICES - provided 4 times/weekly. 7 times/weekly for small extra charge by Resort. * SECURITY - 24 hour security is provided for the entire property. * Call for more info. Gourmet Restaurant on-Site as Well as Swim up Pool Bar and Cafe, 24 Hour Room Service Also Available, as Well as in Room Chefs, Supermarket, Deli, Ice Cream Shop, Video Rental, Internet Cafe and Pharmacy on Site! The best resort in Cabo! Villa la estancia provided us with and amazing experience that we will remember forever. The grounds are beautiful and well maintained and the staff is so friendly. They have everything you could want to make it the most relaxing vacation you have ever had! They are conveniently located and the beach and pool are beautiful. The rooms are gorgeous! The options for activities are amazing and the food is delicious. I can't wait to go back! Top of the line resort! Villa la Estancia is a beautiful resort right on the beach front of Cabo. The resort is the perfect distance from downtown and really close to Wal-Mart which makes it very easy to go pick up some groceries for the week before dipping into the pools. The grounds are exceptional and have beautiful flower beds and grass lawns that surround the pools, patios, fountains, and restaurants. The rooms were beautiful and really big with plenty of bathroom space with his and her sinks, a jacuzzi tub, and separate shower. The other nice thing is that each room has its own thermostat. The room is up on the fifth floor which give the deck has gorgeous views of the ocean and great ambiance from the fountains below. We had a great time bbqing with the bbq on the deck. The deck also has very comfortable lounge chairs and with the warm night breeze, I found my self relaxing under the stars every night. The hotel has 5 large hotubs, 3 of which are right up against the ocean and 1 with a excellent bonfire which is perfect at night, but do close late at night. The pools are great and have walk-in areas, swim up bars, and plenty of water features. Down below the resort, they have their own private beach roped off from beach vendors which keeps it nice and quite. The waves are definitely my favorite part because I could ride them in and out for an entire day! The water temperature is perfect and is really relaxing. The staff in the hotel is also a great plus for this place because they always smiling and very helpful. They treat you well and honestly make you feel like you are at your home away from home. They do a great job of helping with any activities that you want to do or help make reservations with restaurants in town. Absolutely perfect vacation for the whole family! Where do I start about how amazing Villa La Estancia is?? It is an absolutely gorgeous resort! The pool, the grounds, and the staff, are all exceptional! From the moment you walk in the front door you are treated like royalty. First, after a long day of travel, we were greeted in the lobby with cold beverages by Cristian ...a true gem! Check in was a breeze, and then up to unit #3506 on the fifth floor. The unit is beautiful and immaculate, my kids ages 12, 16, 18, could not believe they got to stay 8 nights in such an incredible place, and it was large enough for all of us, and then some! Then you walk out on the expansive patio, and view takes your breath away. The Sea of Cortez is gorgeous! We were travelling with 4 other families staying at this resort, and although our unit was the most beautifully decorated, everyone was so happy with this resort! One added bonus, is that if you stay at VLE, you can use the pools and facilities at the sister properties next door, but they cannot come to VLE, so we did go over to the Palmar and play beach volleyball, and my youngest liked the waterslide, but VLE is so much nicer. The service by the pool was fabulous...we loved the chicken quesadillas and nachos...yum! The swim up bar was a great place to have a drink and chat with our friends, as well as new friends we met there! We also enjoyed the ice cream parlor, café, and convenience store at the front of the resort...delicious latte's in the morning! (we are from Seattle after all) Aside from spending time at the beautiful resort, there are so many fun things to do in Cabo for all ages. The concierge in the lobby booked all of our activities. We went parasailing, jet skiing, took the water taxi out to lover's beach and the arch (a must do), we went on a sunset dinner cruise, we got to see Sammy Haggar play live at Cabo Wabo (so cool), and enjoyed dinner at many great restaurants in town. Shuttle vans are readily available at the resort, and it's a super quick ride into town. It is also a pretty walk into town along the beach! This resort sits on the beautiful Medano Beach, the only swimmable beach near town. They have tons of loungers set up on the beach to use as well. I guess that about sums it up...we loved our spring break in Cabo, and everyone wants to return again next year! (sorry Maui) :) If you get the opportunity to rent this unit, do it! Julia, the owner, is amazing to work with as well...THANK YOU!! This was our second time to this villa at Villa La Estancia. We brought the children this time for a wonderful family vacation. The children absolutely loved the pools and the ocean front villa. We loved the well equiped kitchen and barbeque on the deck for cooking. The kitchen was remodeled with new countertops and a new refrigerator since the last time we had stayed at the villa. Very nice! We loved the washer and dryer which came in handy for the family. The master bathroom was impressive with its hot tub and lots of closet space. We loved all 2200 sq ft of the villa which made it feel like our home away from home. The property was always well maintained and clean. Bruce and Julia provided information on getting around town, restaurants to eat and places to go shopping which made our vacation even more pleasurable. Our family loved to walk on the beach after dinner from town. We have so many happy memories of a wonderful family vacation. We plan on vacationing at this villa in the future. Thank you, thank you for making your beautiful condo available! We - two couples and 4 children (ages 2-18) had an absolutely wonderful time. The pools were great for the kiddos (and us) - some were shallow enough that the parents could watch from the side as the kiddos gained more and more confidence - jumping in, squealing, and turning into little fish! Even through it was spring break season, it never felt packed or full of wild partying - serene, but not boring... perfect! We bought groceries at the Costco and cooked a lot of meals (much easier with the little kiddos). The views were fantastic. The condo was impeccably clean. Service at the hotel was prompt and courteous. We will definitely return as soon as possible. Thanks much! All that Cabo San Lucas has to offer!